When someone mentions Newfoundland to a sport hunter, the first thing that comes to mind is caribou or moose but Newfoundland offers some of the best trophy black bear hunting to be found anywhere. Black bear populations are at record high levels and are the main contributing factor in the decline of woodland caribou populations on the island. In addition to caribou calves as a food source, Newfoundland has abundant fisheries and wild berry production. Mature male black bears often surpass the 600-pound mark measuring in excess of 7 feet in length with large skull measurements. The majority of Newfoundland’s black bears are jet black. 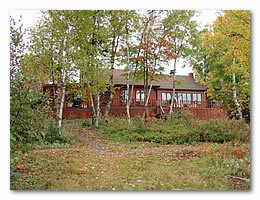 Color phase bears are very rare on the island with an occasional bear showing up sporting a very dark brown hide. This 5-day Newfoundland bear hunt is conducted over well-established bait sites that are tended far in advance of the hunting season thus insuring maximum opportunity for each guest to see multiple bears during a hunt. 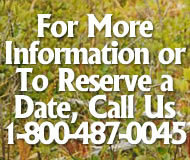 Elevated stands are set in close proximity to the bait stations, taking into consideration both rifle and archery hunters. Bears routinely visit bait sites in the late afternoon and evening hours, allowing guests to spend the rest of their day the opportunity to take advantage of great brook trout fishing available in many of the ponds and streams in the area. Another great feature of this Canadian black bear hunt is the price, which includes airport greeting by your host at the Gander airport, transportation to/from the lodge, meals, lodging, taxes, export permits and trophy care. 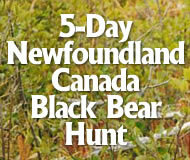 For details or to reserve this Newfoundland bear hunt, contact us via e-mail or call us 1-800-487-0045.